Glory Lily is a perennial tropical flowering vine that makes a stunning, exotic house plant. A vigorous climber, this Gloriosa hybrid grows 1 to 4 stems from each tuber. Along each slender stem are shiny, narrow leaves with twining tendrils at their tips. This vining lily will grasp at anything for climbing up. Providing its weak, wispy vines with a support will give the tendrils something to cling to. Besides, you want to show off its beautiful foliage and flowers. Those big, crimson-red flowers are nothing short of glorious. 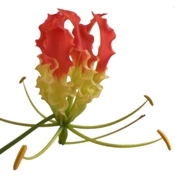 Growing from the leaf axils, the long wavy petals are bright red with yellow at the base of the flower. Prominent stamens look like wheel spokes beneath the 6 back-swept petals. You can expect flowers throughout the summer. Gloriosa superba 'Rothschildiana' flowering plants may be difficult to find in garden centers. Dormant tubers are available from online nurseries that specialize in flowering bulbs. Give it support. Train this tropical vine to climb a trellis. 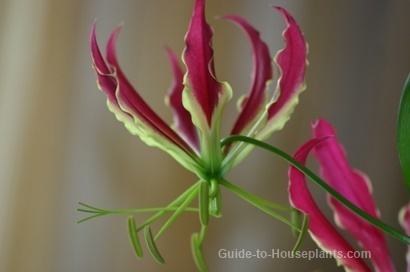 Glory Lily has tendrils at the tips of its leaves that readily cling to a support. Use florist's wire to loosely hold the vine to a trellis to get it started. You may have to adjust the wire as the vine grows. Deadhead flowers. Cut off spent flowers to keep the plant looking its best. Removing them will also encourage the plant to produce more flowers. Overwinter tubers. After flowering is over, cut back on water to induce dormancy and allow the foliage to die back naturally. Cut off withered stems and store tubers in their pots for the winter, in a dry, cool (around 60°F/16°C) place until spring. Repot the tubers in fresh potting mix in spring for another season of gorgeous blooms. CAUTION: All parts of this lily are poisonous. It's not a good idea to have it around children or pets. 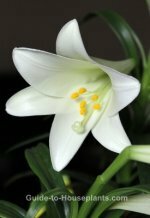 Light: This vigorous lily needs plenty of bright, indirect sunlight to bloom. Water: Keep evenly moist in spring and summer. Don't allow the medium to get soggy because tubers will rot. Humidity: Moderate to high humidity. Raise the humidity around the lily by misting the foliage or setting the pot on a humidity tray. Fertilizer: Feed every 2-3 weeks with a high-potassium liquid fertilizer diluted by half while plant is growing. Propagation: Divide offsets of tubers formed during the growing season, or sow seeds in spring. Pot each tuber separately in a 6 in (15 cm) pot. Plant tubers 1 in (2.5 cm) below the surface of the soil. Handle Gloriosa tubers carefully -- they're brittle and may break.